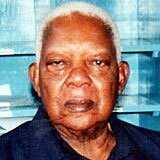 Two of Tanzania’s most distinguished chiefs in the period before independence have passed away. On the mainland things have been relatively quiet politically in recent months. 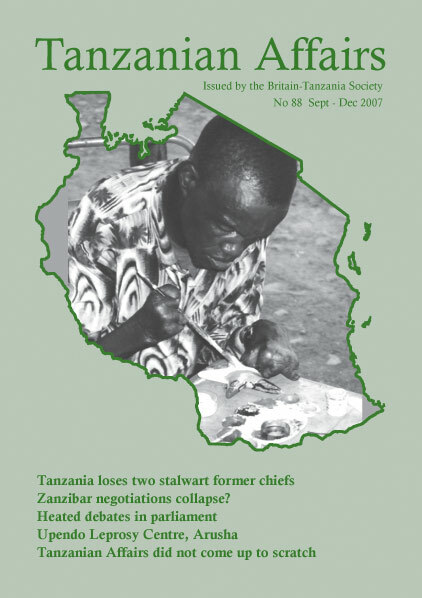 But, as this issue of Tanzanian Affairs went to press, there were heated debates in parliament as the opposition parties tried to exercise their limited muscle. National Assembly Speaker Samuel Sitta prevented the tabling of a private member’s motion by Dr Wilbroad Slaa, opposition CHADEMA MP over an alleged scam at the Bank of Tanzania – Mtanzania. In her 2007/2008 budget statement in June, Finance Minister Mrs Zakhia Meghji stated that she would not borrow from the domestic market this year through Treasury bill and government bonds. The East African described this as the most ambitious fiscal target by a finance minister in years. She must have felt under some pressure to do this because large government deficits make it difficult for the private sector to obtain credit and contribute to inflation. Interest rates on Treasury bills are 16% in Tanzania compared with 12% in Uganda and 6% in Kenya. In the previous year the Government took TShs 35.92bn from the Bank of Tanzania. Mrs Meghji indicated that next year’s revenue should be enough to enable the government not to borrow locally as weather forecasts appeared encouraging. She will be relying on considerable support from the donor community however to do this. Some 42% of the budget would come from donors – up 3% on 2006/2007. Many of the other measures she announced attracted strong criticism especially a proposed increase of almost 9% on diesel and petrol and also more tax on kerosene which would have seriously affected the poor. Some opposition MP’s described the budget as the worst since independence. Eventually, under heavy pressure from MP’s, she deleted the kerosene tax increase from the budget, and reduced the proposed increase in vehicle licenses for smaller vehicles and increased them for luxury cars. Priorities for expenditure were: education (18%), roads (12.8%), health (10%) and water (5.1%). She was criticised by MP’s for allocating only 6.2% to the agricultural sector. Funds were also provided for the identity card scheme which is aimed at facilitating tax collection, accessing bank credit and to help in the war against crime. Income tax for low income earners was reduced from 18.5% to 15%. The budget also had a ‘green’ element. Tariffs for low energy consuming bulbs and solar energy panels were zero rated. In summary, the Government expects to spend TShs 6.06 trillion, an increase of TShs 1.20tn on the previous year. Meghji praised the efforts being made in revenue collection and estimated that GDP would grow at 7.3% this year. In March 2007 a gold coin minted in German East Africa in 1916 was sold for £1,400 by the London auctioneers Dix Noonan Webb. Sometimes known as the ‘Tabora pound’, this coin has an interesting history. Journalists writing articles criticizing the government were at times harassed, threatened or arrested. Three journalists of Rai newspaper were arrested and charged in July. In August a Citizen journalist was arrested and threatened with being stripped of his citizenship and expelled from the country on account of an interview he gave in a documentary film about arms trafficking. Three visiting mainland journalists were briefly arrested in Zanzibar in September. Female genital mutilation continued to be illegally practised in many rural areas on the mainland, with rates of over 80 per cent among some ethnic groups. No prosecutions were reported. The World Health Organization reported a high rate of domestic violence in Tanzania, with 30 per cent of victims suffering serious injuries due to severe beatings. The government accepted the need to reduce severe overcrowding in prisons but little action was taken. The National Commission for Human Rights and Good Governance inspected mainland prisons and criticized harsh conditions, particularly the holding of juvenile prisoners together with adults. The Commission was still barred by the Zanzibar government from working or opening an office in Zanzibar. The government ordered the deportation of all illegal immigrants who had failed to register or apply for citizenship. Deportations began of several thousand people originating from neighbouring countries such as Rwanda, Burundi, Uganda and Democratic Republic of the Congo who had lived in Tanzania for up to 15 years or longer. There were a much larger number of such people, some of whom were former refugees integrated into rural communities who had never regularized their status. In August President Kikwete commuted all death sentences on mainland Tanzania to life imprisonment. The total number of commutations was not officially disclosed, but was estimated to be about 400. At the end of 2006, no one was under sentence of death in Tanzania. NEW SCIENTIST (April 21) described how a farmer in Zanzibar, had a severe shock four years ago when he went to harvest his cassava (manioc). “The bushes looked healthy” he said, but when he dug up the tubers he found every last one had rotted away. “I had lost my entire crop. And we were hungry and I was desperate”. What he didn’t know then was that his crop was the first known victim of a plague caused by a new and virulent strain of the ‘cassava brown streak virus’ that is now spreading across eastern and central Africa. Other pests and viruses that afflict cassava – notably the ‘cassava mosaic virus’, which has been advancing across East Africa since the late 1980s, leave visible marks on the foliage but always spare some of the crop. Brown streak is a stealth virus. It has been known since 1935 when British scientists reported it in coastal Tanganyika but, until recently, it remained largely confined to Tanzania’s low-lying coastal plains. Now it has become much more virulent – apparently starting from this farm in Zanzibar. It is a threat to the whole of sub-Saharan Africa. According to the Institute for Tropical Agriculture’s branch in Dar es Salaam, cassava yield in Tanzania has fallen by between 50 and 80 per cent and during the past five years. The economic damage to farmers is conservatively estimated at more than $50 million a year. The institute has cross-bred some of the local varieties in Zanzibar with other varieties that seem to tolerate the new virus. The first trials have been successful and some of the new varieties have now been released to farmers in Zanzibar so moving from trials to a fully operational project. Farmers in Zanzibar are clamouring for the new varieties especially a variety called Kiroba which is a favourite because of its sweet taste and smooth texture. EAST AFRICA FEDERATION – A SLOW DOWN? As happens from time to time in the European Union, enthusiasts for a ‘fast tracking’ process to expedite progress towards the establishment of an East African Federation, are coming up against more and more opposition. Many Tanzanian MP’s have publicly declared their opposition to the establishment of such a federation by 2013 but, according to East African Cooperation Affairs Minister Ibrahim Msabaha in an interview with The Guardian, they had done so as individuals and not on behalf of the people they represented. Most of the delegates who contributed to a recent debate of legislators in Dodoma rejected the fast-tracking idea as a non-starter, saying the citizenry needed more time to evaluate the process before making a definitive stand that would take the nation’s interests into account. Dr Msabaha explained that the Government was not against legislator’s opinions so long as it was understood that they aired their views in their personal capacities and not by virtue of their being the official legislative representative of the people in their respective constituencies. The fact that only a fraction of the legislators who gave their views were staunchly against the fast-tracking idea raised many questions. The dominant view among the MPs, just as is the case with the larger public, relates to fear of the possibility of Tanzania becoming a loser after the formation of the proposed federation. Most people interviewed on the issue have said they do not see the need of having the federation at the moment because Tanzania is still lagging behind Kenya and Uganda in economic development and might end up being little more than a market for the goods they produce. Many recommended that the formation of the federation should get peoples’ consent, preferably through a referendum.